A wonderful resource to help children explore, learn and practice number bonds to 10 in an enjoyable and meaningful way using real objects that attract their interest. Made from sustainably sourced and FSC approved beech wood, the tray is both practical and portable: children can use the tray to collect items both inside and outside the setting and carry them back safely for future learning opportunities. Measures 15 x 6 x ½ inches. Correlation to Common Core: K.CC.B.4, L.K.5a, K.OA.A.1–4, K.MD.B.3. Correlation to ECERS-R: Language-Reasoning – 17, Activities – 26. Correlation to ITERS-R: Activities – 15, 22. 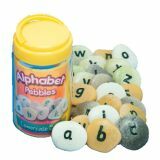 Durable pebbles sets appeal to children's natural instinct to explore, investigate, sort and collect. 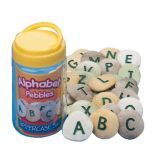 Specially cast from a durable mix including real stone, each pebble is engraved with a single letter. Pebbles are approximately 1 1⁄2" in size–perfect for small hands! Includes ideas and activities. 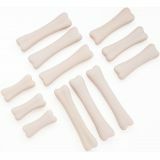 Encourage children to match, count, compare, order and measure bones of differing lengths in the Dinosaur Bones Match & Measure Set. The colorful 8" x 11" PVC cards are durable enough for outdoor play and can even be used during water play! A wonderfully exciting way to introduce measurement to young children! 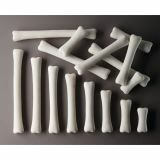 Tactile Dinosaur Bones come in eight different lengths to illustrate the concepts of measurement, doubling and halving. 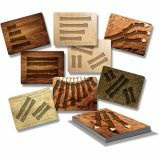 Combine with Activity Cards (sold separately) to encourage children to match, count, compare, order and measure bones of differing lengths. The colorful 8" x 11" PVC cards are durable enough for outdoor play and can even be used during water play! 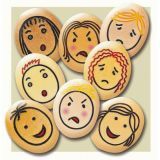 This beautifully crafted set of stones is engraved with faces showing 12 common emotions: happy, sad, angry, frightened, worried, surprised, confused, bored, calm, proud, shy and embarrassed. Each set includes 12 pebbles (measuring 13⁄4") plus a helpful guide with ideas and activities. 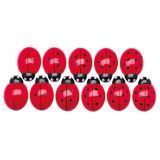 Create a buzz both inside and outdoors with these durable plastic activity cards. 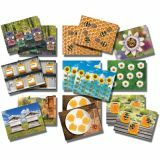 The Honey Bee Early Number Card set includes 16 durable plastic cards, measuring 8 x 11 inches. Create a buzz both inside and outdoors with these adorable honey bee stones. 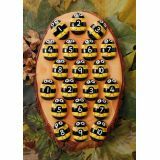 The Honey Bee Number Stones include 20 bees (two each of numbers 1-10) and measure 2 inches long. 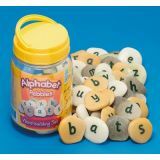 Especially for young learners, ages 2+, this set features 8 large stones that are perfect (and safe) for small hands. 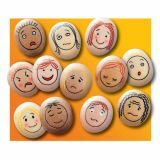 Includes two examples each of the four emotions that young children most readily identify and experience–happy, sad, surprised and angry. 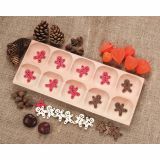 Durable and washable, each stone measures approx. 2 1⁄2".